It has been a pretty tumultuous time for Little A. Besides the arrival of his brother Louis, grandparents have been in and out, Mum can’t lift or carry him, and ten days ago, Alec started nursery school. He has had a pretty good start but it is definitely an adjustment. And for us as parents, it also feels like a whole new phase of our lives. Parent-teacher meetings etc really make you feel like a grown-up! First of all, we had to label all of Alec’s clothes. I blanked out and forgot that my friend Emma had recommended these great labels when she shared her favourite things, so I just bought a fabric marker from Polarn O. Pyret and went at it. We also had to leave some things for nap time – a teddy bear (Alec doesn’t use a specific lovey, he is happy with several of his stuffed animals, so we sent along this striped Jelly Cat bear), a pacifier, a pillow and pillow case. The nursery school has blankets and mattresses that the children use. I just sent along a regular white pillow case, but I think I am going to sew a couple of more unique pillow cases for Alec to bring to nursery school so they are easier to recognize. We also had to leave some emergency clothes changes in case of spills or other accidents. I put two little outfits into a big freezer bag and labeled it “Extra Clothes for Alec”. We also bought an extra pair of Alec’s favourite rain pants from Polarn O. Pyret (I wrote about them here) to leave at nursery school so we don’t have to worry about forgetting them over the weekend. I might get him another pair of rain boots as well. And lastly, I made a sign to help me document his first day of nursery school in photos. I plan to do the same for each school year as long as he will let me. wow! congrats. this is a big step – how do you feel personally? do you miss Alec? and what will he be learning/doing during the day at nursery school? what is the Swedish philosophy on when to start formally teaching children things like the alphabet and numbers? So, out initial impression was that there isn’t much pedagogical content in the program he is in – it seemed like all unstructured play all the time. But I think we underestimated the “curriculum” a little. At such a young age, they focus a lot on just having the kids get comfortable in a routine and having all the different phases of their day working well: arrival, getting all their gear off, finding their place in the circle, mealtimes (there are two snacks and cooked lunch to get through), nap time etc. Three days a week they do “project work” in the mornings. The focus area for the coming months is “mathematics” and they will be working with shapes and colors as well. I think the learning is very much through play and I think the focus is on just enjoying learning more than what they are actually achieving. Stay tuned! So interesting and similar to our experience. As an American living in Sweden, while I really appreciated the healthy eating, outdoor play (rain or shine) and outdoor activity with nature of pre-schools in Sweden, I never quite found a pre-school that felt like I did about early pre-education. I try to remain humble to the culture I find myself living in and just found that if this was really important to me that 1) I’d go out of my way to find a pre-school that felt good and 2)although difficult, I had to accept that my ideas about pre-school education were in the minority and: 3) step up these aspects up at home — more math, reading and writing. It’s amazing what strides one can make with a little home focus and effort — in the end, it’s lead to on-going supplementary homeschooling which in some ways is only natural because it’s very important for me to share “where I come from and Mommy’s path” with the kids. It’s amazing how much I’ve realized that many of these basics also reflect our own cultures. My broad experience with Swedish education is that kids are really supposed to get all of the playing our of their systems before moving on to learning;learning (reading, writing, math) comes later…. This entire notion is one I find myself turning upside down and returning to again and again: This is a nation of such high literacy but, when in the “starting blocks,” it feels much more like a distance game and not a sprint. In the end, we chose a Montessori school because 1) I felt that they offered a little more well rounded school or were comfortable with parents looking for more — more math, more reading, etc — even if it came in the form of, at first, baking bread (and reading a recipe — math! ), etc in a very sensitive, thoughtful atmosphere. And, 2) language. 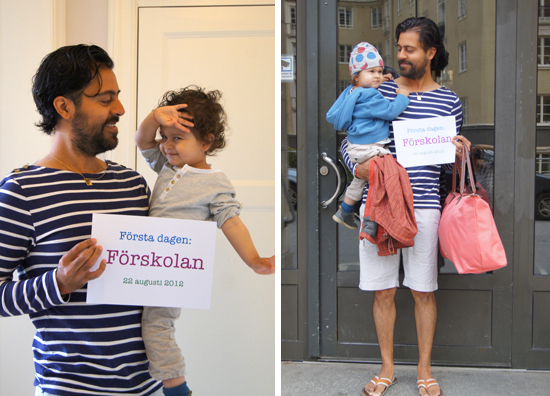 The teachers at the Montessori schools we visited seemed dedicated, down the the words these carefully chose with the children and for me, again as an “immigrant;” I felt that these were were words that would build the foundation of my children’s Swedish. Last: very cool about the signing! Maybe, all of the above won’t pertain to your experience in in two years since my children moved onto “real school” strides have been made!